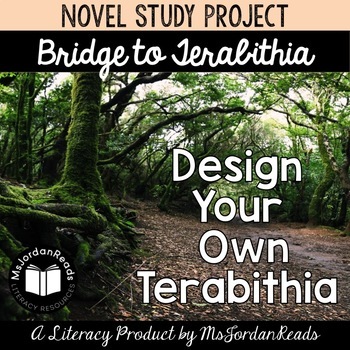 Are you looking for a fun project to wrap-up your novel study of Bridge to Terabithia? 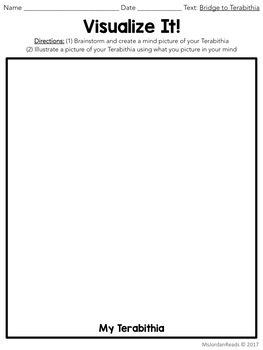 Students will love designing their own Terabithias for this end-of-the-book final project. 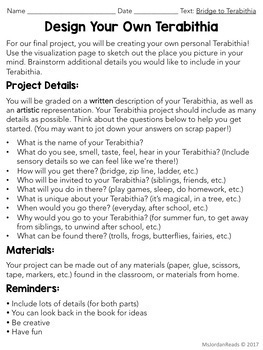 It's a two-part project where students have to complete a descriptive writing piece about their personal Terabithias and also create an artistic representation of their Terabithia. Guiding questions and a brainstorming page are included so that they can record their ideas and sketch out the Terabithia they picture in their minds. 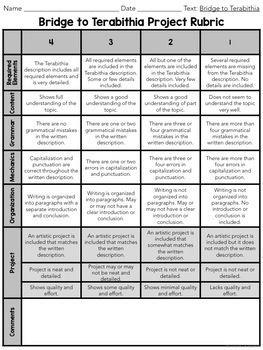 This final project is PERFECT for a fun, culminating activity! Students will have the opportunity to be creative and show their understanding of what a "terabithia" truly means to them. Email msjordanreads@gmail.com with any questions or comments!